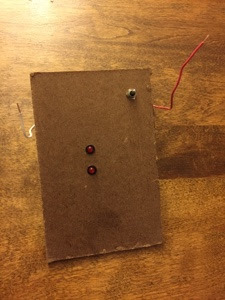 In my last post I shared my frustration with getting LED indicators to work with Micro Mark switch machines. Unlike other switch machines, they have no additional contacts - just two power wires coming in. But I figured it had to be possible to have control panel indicator lights work with them, and I finally found an article that showed me how to do it. Interestingly, the text of the article mentions using Miniatronics LEDs & resistors (#12-050-18), but the diagram shows using a 1K resistor, while the Miniatronics includes only 470 ohm resistors. Also, the diagram shows a 9VDC power supply, while I plan to use a 12VDC power pack. Finally, while it's not labeled on the diagram, those arrows pointing "northeast" are the wires going to the switch machine. Figuring I'd be no worse off than my previous testing, I decided to use what I had on-hand (the Miniatronics resistors/bulbs and the 12VDC power supply). To secure everything, I decided to temporarily mount it all to a scrap of masonite. Yes, it's 1/8" masonite. And here's the back view - I just wire-nutted everything together according to the diagram. 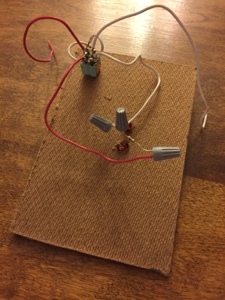 The toggle had been wired/soldered during a previous work session. So it looks like I'll be able to proceed as I'd planned, using Micro Mark switch machines with LED indicators on a control board. Oh yeah, the control board. . . . I still haven't figured out how I'm going to proceed with that (see this post for the problem). Since (I think) I've solved the more complicated wiring issue, I'm leaning toward just redoing the board with thinner (1/8" thick) masonite. But I got some great feedback/suggestions so I may try and rout out the back of the board where the toggles are. Probably the best way to do this would be to use a drill press and a forstner bit (thanks for the suggestion Mike! ), but all I have is a drill and a spade bit - so I may try and wing it with those. Stay tuned! Chris, it's not too critical what resistor value you use, as long as you do use one to keep from burning out the LEDs with too much current. A higher value will make the LEDs dimmer. A lower value will make them brighter. You can try a variety of values until you find one that sets the LED brightness to a level you like.